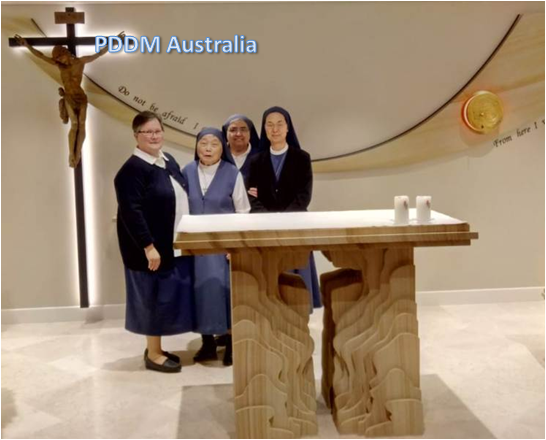 PDDM Australia: The sisters of the Australian Delegation had the joy of welcoming, the general councillor, Sr M Giovanna Uchino to the land “down under”. Sr M Giovanna stayed with us from 11 September until 24 September 2018. All the sisters gathered in the Strathfield community for some significant events which were to take place during their stay. The first was to joyfully participate, together with Sr Giovanna, in the memorable blessing ceremony of our renovated chapel. On this special occasion, we also felt the presence of our Superior General and her councillors and we greatly appreciated the best wishes and the beautiful gift of a chalice, ciborium and paten which Sr. M. Micaela sent us. During Sr. Giovanna’s visit we also welcomed our new Delegation government team: Sr M Catherine Attard, Delegate Superior, Sr Anita D’Souza, Councillor and Secretary, Sr Catherine Hipwell, Councillor and Bursar. We wish them every blessing. The sisters were happy to take part in the Delegation assembly which was conducted by Sr Giovanna. During the Assembly we were helped to deepen our understanding of the second call of the 9th General Chapter: “Towards a New Design”. There was a lot of lively exchange of ideas and opinions of how to embrace change and to go forward in the living out of our charism and mission with joy and hope. We thank the Lord for all the gifts he gives us in order to communicate his unconditional love for humanity.